After hitting the airwaves around the globe over the last couple of weeks, the Money Tree has had a tremendous reaction at radio. 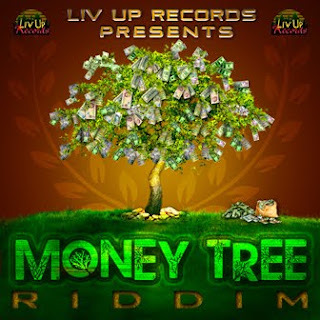 Already a staple on taste-making Jamaican radio shows on ZIP, IRIE, HITZ and FAME FM, the Money Tree has also been getting good spins in the US, Canada and UK. "We're very pleased with the reaction so far," says Livup Records' Crumbs. "We managed to keep the riddim exclusive for a few weeks until release date instead of just blasting it out to everyone for free. Hopefully with the digital release today we can generate some income that we can reinvest into music." Crumbs also outlined plans for Livup Records to open their own studio in the near future. "Thats why its important for music-lovers to support Dancehall and Reggae music aswell as it being important for producers to make the product available and marketed properly. We have to pay to record, pay to mix, pay to promote and if we are not getting the sales then how can we survive? But as Serani says in his song on the Money Tree I'll try until I die cuz I've got to survive!" Money Tree contains 18 tracks available for purchase, including the bomb-heavy instrumental. Individual tracks are 99 cents each or the entire album can be bought for just $9.99. Livup Records also has the Stronger riddim (Cultural Rock and Lover's Rock editions) as well as their award-winning Good Life riddim available for purchase online at all digital stores.